Jeremy Goldman as Dan, Susan Schindler as Diana. Photo by Mort Shuman. 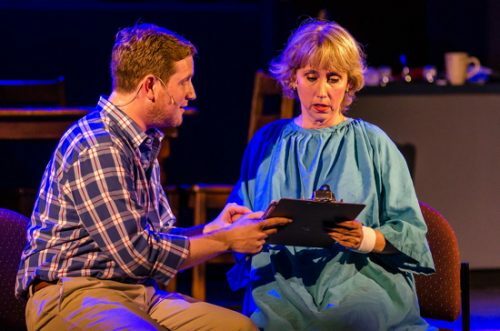 “Next to Normal” (directed by Steven Fleming) is not your usual, feel-good musical. After all, who writes a musical about manic depression? Thankfully, Brian Yorkey did because this intense musical about a suburban mom living with mental illness will leave you with all kinds of emotions… just not necessarily the ‘feel-good’ ones. There are no big dancing numbers and no huge declarations of love, but there is plenty of drama and over 30 songs to keep you going on this emotional roller coaster. Diana Goodman (Susan Schnidler) seems like the typical mom. She has two kids (a boy and a girl); the boy (Danny Bertaux) stays out late, and she worries about him. The girl (Christie Smith) stays up late with schoolwork, and she worries about her too. All seems to be normal until you realize the mom is crippled by manic depression and hallucinations. …there is plenty of drama and over 30 songs to keep you going on this emotional roller coaster. Diana sees her pharmacologist (David Woodward) who declares that she’s stable when she says she doesn’t feel anything. As she realizes she misses her highs and lows, she flushes her medication, and everything seems good for a while — until she ruins a promising family dinner. Diana sees a new doctor, who recommends a drug-free treatment which includes hypnosis and therapy. Diana seems to be improving until her hallucinations return, and she attempts suicide. At that point, the doctor recommends ECT (electroconvulsive therapy). After ECT, Diana experiences severe memory loss — although those memories slowly come back. She refuses additional treatment and chooses to finally leave her supportive husband (Jeremy Goldman). She wants to try to make it on her own. Meanwhile, Diana’s daughter, Natalie, is fighting her own battles. Her mom doesn’t even seem to remember she’s there; their lives have been overtaken by her mother’s mental illness. Natalie finds a supportive boyfriend (Michael Nugent), but she gets into drugs and pushes him away. Still, he keeps coming back, declaring he’s perfect for her. Diana (Schindler) perfectly captures her kaleidoscope of emotions – displaying love, sadness, and frustration (among others) depending on her frame of mind. Natalie (Smith) is a typical teenager who just wants to be a typical teenager without the burden of her mother’s illness. She’s worried about being invisible to her mother while worrying she’ll turn into her. Dan (Goldman) is the perfect supportive husband – almost too perfect in my mind as he seems to retain his composure despite Diana’s manic/depressive episodes. Even after 16 years, he handles Diana calmly, taking her to the doctor’s as often as needed (I assume he misses a lot of work) and always trying to do what’s best for her. Ironically, Gabe (Bertaux) seems more alive than many of the other characters (even repeatedly singing the catchy tune ‘I’m Alive’) since he doesn’t need to worry about dealing with Diana’s illness. While Diana seems to ignore Natalie, Gabe always has her full attention. The production is more music than dialogue, but the music and lyrics provide energy and emotion – along with a conversational rhythm. The conductor (Scott AuCoin) and musicians are actually on the stage, tucked into a corner. Diana’s songs reflect her personality – frenetic, jumping from key to key and changing from a ballad to a music-box-style lullaby. And Diana’s lyrics are not run-of-the-mill, one-size-fits-all musical lyrics – they are powerful and completely convey her emotional state. In ‘You Don’t Know’, she perfectly describes how she feels — ‘Do you read obituaries and feel jealous of the dead?’ and ‘When tomorrow terrifies you, but you’ll die if you look back’. There’s also some comic relief as Diana sings about her favorite drugs (with a riff from ‘My Favorite Things’), the drugs’ multiple side effects, and the fact that her doctor knows everything about her, yet she only knows his name. In general, the songs are complex, with intricate melodies and multiple characters singing – or often singing different songs at the same time. The best part is when the actors come together and harmonize, which kind of describes the family in general; if only they could come together, their lives would be so much better. The set (Alex Porter) is the Goodmans’ two-story home, with the kitchen front and center (after all, the kitchen is ‘the heart of the home’). Of course, it makes sense that the set is fragmented since the lives of the characters are fragmented as well. And since the set is bi-level, there can be action on each of the floors simultaneously. This means that Diana and Dan can be on one level singing while Henry and Natalie can be on another level mirroring Diana and Dan with their own song (‘Why Stay?/A Promise’). It also means there is always action as the cast runs up and down the stairs and appears on different levels at different times, showing excellent direction from Steven Fleming. The only drawback is the screen in the background, which intermittently projects pictures of the brain. In my opinion, this was distracting and unnecessary; the focus should be on the actors. Although “Next to Normal” is not the usual, feel-good musical, the production tackles a challenging subject with honesty and emotion. And at the end, we feel hopeful that ‘It’s Gonna Be Good’ with a family’s love and support. If you want to escape your own reality and get into the mind of someone else’s, this is definitely a production you want to see. Advisory: Adult themes (suicide, drugs, mental illness), obscenity (a lot of it!). Running Time: 2 hours, 15 minutes with a 15 minute intermission. Next to Normal plays through May 22, 2016 at Silhouette Stages performing at The Slayton House, 10400 Cross Fox Lane, in Columbia, MD. For tickets, call (410) 637-5289, or purchase them online.